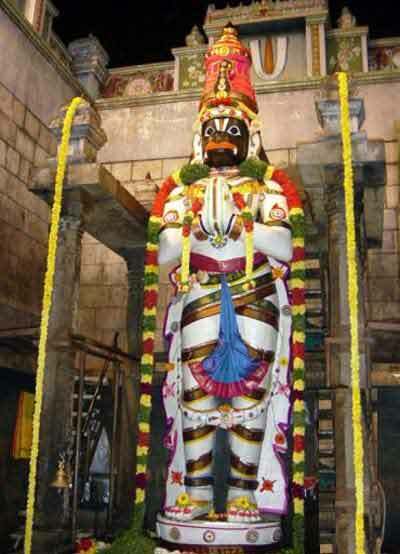 Viswaroopa Adhivyadhihara Sri Bhaktha Anjaneya Swamy at Nanganallur in Chennai is popularly known Nanganallur Anjaneyar Temple. This famous Hanuman Temple is around 10 km from city center and around 5 km from Chennai International Airport. The temple houses a huge 32 feet Hanman murti. The temple complex has a subsidiary shrine dedicated to Ram Parivar – Sri Ram, Lakshman, Mata Sita and Hanuman. Other subsidiary shrines here are the ones dedicated to Nagas, Ganesha, Lord Krishna and Rukmini. It is very rare to find a Krishna shrine in a Hanuman kovil. The popular belief is that those who offer prayers here will be blessed with good health.